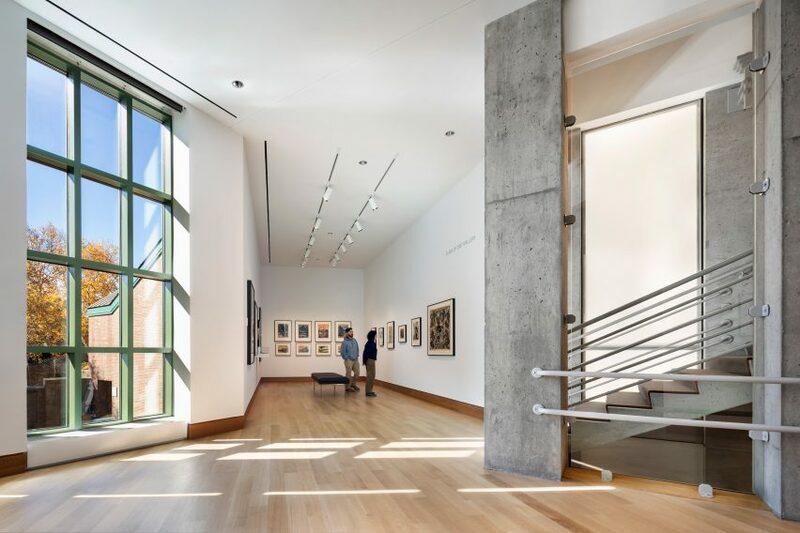 Tod Williams Billie Tsien Architects' major extension and renovation of the Hood Museum of Art in New Hampshire has kept postmodern architect Charles Moore's glass and grey-brick stairway as its centrepiece. The Dartmouth College arts institution is set to open on 26 January 2019, following the effort to increase its teaching facilities, and add galleries to show more of its extensive collection of over 65,000 works. Tod Williams Billie Tsien Architects' project adds 40 per cent of floor space to the Hood Museum, which Moore completed in 1985, increasing its size to 62,400 square feet (5,797 square metres). Additions include six new galleries to the existing 10, and three new classrooms featuring the "latest object- study technology" – tripling the number of teaching spaces previously. Curved around a courtyard, the original building nestles between the campus' 19th-century red-brick Wilson Hall and the modernist Hopkins Center for the Performing Arts, built by Wallace K Harrison in 1962. Husband-and-wife duo Williams and Tsien have covered this outdoor area to create a ground floor space for meetings, dinners and performances, and galleries on the floor above. The lower lobby includes a double-height entrance into the museum, with Moore's existing glazed stairwell running alongside to allowing natural light into the galleries behind. The new roof acts as a shading device for the windows in the staircase, preventing glare that previously obstructed the view inside. While aiming to preserve as much as the existing structure as possible, Williams and Tsien were required to remove portions in order to improve the layout. The pair compared this process to untangling a ball of string when they unveiled the design at press conference last year. Sections were demolished to create new routes through the museum, including a north-south link to Dartmouth's green, and an east-west path through the campus. The latter joins an entrance in a new top-heavy volume at the front of the museum. It is built from an "off-white" brick to complement the red brickwork of the existing structure. Other details intended to enhance the existing building include an arched window, which follows the curve of an opening in the existing Moore building. A gallery space occupies the upper level of the new volume and is punctured by a 14-square-foot (1.3-square-metre) window, intended signal the building as a beacon on the campus. Entry in this side leads into a new second staircase, which the architects added to form a continuous route through the building, supplementing the existing stairway. A simple palette of white-painted walls, wooden floors and grey stone is intended to provide continuity through the ground and first floors of public exhibition spaces and study galleries. While these two levels are open to all, Williams and Tsien have assigned administrative offices to the second floor, and object storage and exhibition preparation to the basement. The Hood Museum is considered one of the most important projects by Moore, who was described as "one of the most influential and prolific practitioners of postmodern design" in an obituary by the New York Times, following his death aged 68 in 1993. Due to his prominence, Williams and Tsien have faced criticism for the changes they proposed to the building as part of their $50 million (£38 million) overhaul. In response, the firm argued that amends would improve the original, and urged critics to hold off on judgement until the museum reopens. "It's not so easily identifiable, it's very knitted," said Tsien in 2018. "I think it's an important part of thinking about simply of objects all over the place, but a knitting together." The firm – which was established in 1986 – is best known for its 2001 American Folk Art Museum in New York, which was controversially demolished 13 years after it was built to make way for the expansion of neighbouring MoMA. Tod Williams Billie Tsien Architects has experienced similar controversy for projects including the completed Barnes Foundation in Philadelphia, and the upcoming Obama Presidential Library, which is set to be built in Chicago's historic Jackson Park.